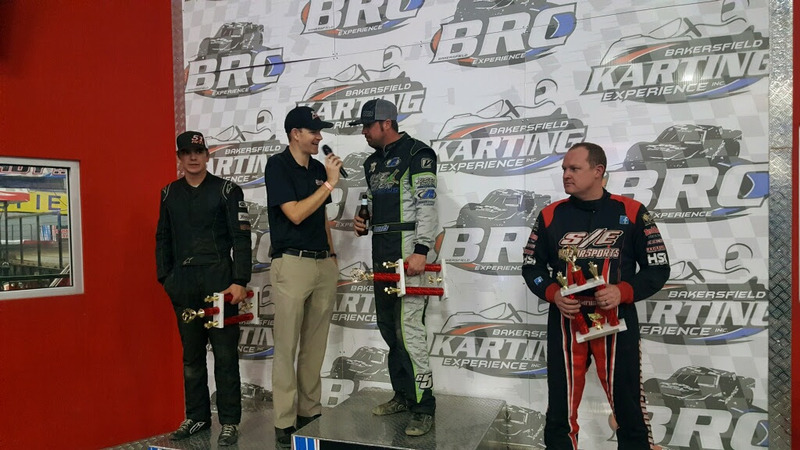 BAKERSFIELD, CALIFORNIA (January 20, 2018) – The opening night of the inaugural Bakersfield Indoor Kart Nationals at Bakersfield Karting Experience saw IMCA Modified champion Brad Pounds take the $400 Open Outlaw Kart victory. The 1/10th mile dirt oval also hosted three divisions of Mini Dwarf competition and Beginner Box Stocks during the busy night. Pounds used a daring outside pass to take the lead, then assumed the lead after Tyler Seavey relinquished it in a scuffle with lapped traffic. 26 Open Outlaw Karts were in action with six heat races and twin 14 lap B Mains setting the 12 kart lineup for the feature. Redding’s Brandon Williams started on the pole and led early before he spun and Bakersfield’s Tate Sanders, in his career Outlaw Kart debut, took over the lead. Sanders also won his heat race earlier in a strong debut performance. Pounds reeled in Sanders and drove up to the cushion for a slingshot run down the backstretch to the take the lead, much to the approval of the strong crowd on hand. The Bakersfield IMCA Modified champion was passed a few laps later by Seavey, who started seventh after winning the first B Main. Seavey looked poised to drive away with the victory but was halted when Kailyn Lopez spun in front of him in turn two for a caution. Seavey stopped and had to restart at the rear of the field. Pounds held off Sanders and Chowchilla’s Eric Humphries over a sprint to the finish for the victory. All three have their eyes set on Saturday’s action which will pay $1000 to win. Nine Beginner Box Stocks staged an entertaining 20 lap race. Four year old Bentley Nelson led the all green flag affair until he spun on lap 19 to surrender the lead and force a caution. Bakersfield’s Spencer Vasquez took over the lead and fended off a tough challenge from Chowchilla’s Kenzie Brown to get the hometown win. Khloe Cotton charged through the field to finish third. Jett Yantis continued his sterling run at BKE in Sr. Mini Dwarf races, taking another victory for the 2017 Bakersfield Speedway Jr. Mini Dwarf champion. Yantis held off Trenton Eurto early in the event. A late caution brought the field together and allowed Kennedy Cotton to nab second from Eurto near the finish. Jr. Mini Dwarf saw double-duty racer Khloe Cotton use what she learned in the Beginner Box main to hound race leader Bryson Martin. 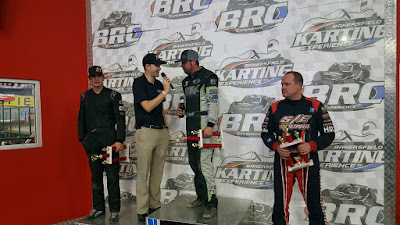 Martin would not be deterred, however, as he went on the for the 20 lap main event win. Blake Watson and Emma McKellar were the top-two in the Jr. Jr. class as well. Saturday’s activities for the Indoor Kart Nationals include a $200 to win Clone kart feature and Box Stocks. Open Outlaw Karts will race for $1000 to win for nationals feature. Saturday’s show will be an afternoon show with drivers meeting at 1 pm. General admission tickets will be $15 on Saturday. The full complex is open including the restaurant, arcade games, golf simulator, rental kart racing, RC car racing, live music, and so much more. Event is being presented by 51FIFTY Energy Drink, H&S Body Works, Kern Asphalt, and American Fabrication.